The Gold Plated Pad is the same as the Black Gold Pad except that it has an extremely thin layer of gold added. It shines with wonderful tone that is unequalled by any other pad. These pads also have a significant portion of black dry lubricant (MOS2) embedded into the surface along with the gold to prevent sticking. Gold particles are also embedded directly into the film - this high tech achievement gives you an extremely durable surface. Using a metallic pad is like using a pad that is entirely resonator - all that beautiful tone is reflected to the listener instead of being absorbed into the pad. The flat soft surface makes a perfect and quiet seal when closed on the tone hole. They do not swell with moisture, warp, dry out, or rot. You will find the tone that Gold Pads bring to your horn to be unequaled by any other pad/reso combination. 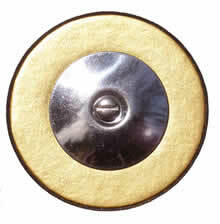 The Gold Plated Saxophone Pads come standard with domed stainless steel resonators. Domed, smooth faced nickel silver resonators are available special order. Because JS pads are made specifically for each instrument please be aware that orders for JS pads may not ship for 1-2 weeks from the order date. 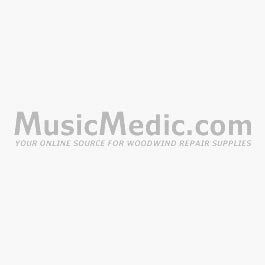 In the comments section of your order, please state the model and approximate serial number of your instrument. This will insure that you get the correct pads and help speed up delivery. First, float the pad onto a bed of shellac or hot glue until it is as level against the tone hole as possible. Then, with a leak light in place and the pad lightly closed, warm the cup only in the area of the leak and use a sharpened wire to pull out the plastic rim of the pad in the area of a leak. Try to warm the cup while you are pulling and viewing the pad so you will know when it is warm enough; remember to not overheat the pad cup.